Claude “Rocky” LaRock was born 1958 in Seattle Washington. At 12 years of age Rocky moved to his Mother’s homeland, a First Nations Community called Chehalis, located in the Fraser Valley of British Columbia, Canada. 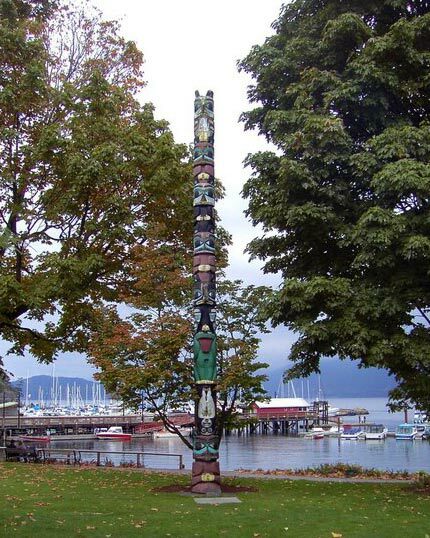 At 19 yrs of age Rocky found his calling as a carver when he was walking along Jericho beach; he came upon a man carving a Mermaid out of driftwood and was hooked. Shortly after Rocky began his apprenticeship under First Nations master artists’ Francis Horne Sr. and Ron Austin. Three years under their direction he learned the skills, techniques and stories of hand-carving the traditional way. Rocky took these teachings and added his own contemporary style. Throughout the last three decades Rocky has maintained a steady career as a First Nation’s artist. Besides showcasing his work in galleries, businesses and private collections he also employs his talent to teach native culture and art as a positive outlet. For example, in ’08/’09 Rocky worked at the University of the Fraser Valley within the visual arts department as Instructor and Studio Technician for the Indigenous Design & Technology program. From the 80’s till present Rocky has worked with troubled Native youth and inmates as a counselor and teacher, using art as a means to recovery and wellness of mind and spirit. Rocky also offers workshops for youth and/or adults. Rocky’s art is greatly influenced by the forests and surrounding wildlife and a lifestyle rich in the Coast Salish native culture. Rocky continues to reside with his family in Chehalis and is an active member of the community and cultural traditions.